Christen Clifford is a writer with a New School MFA, 2006 NonFiction Competition prize, 2007 fellowship in Nonfiction Literature from the New York Foundation for the Arts, and work published in Salon, Nerve, and New York Press. 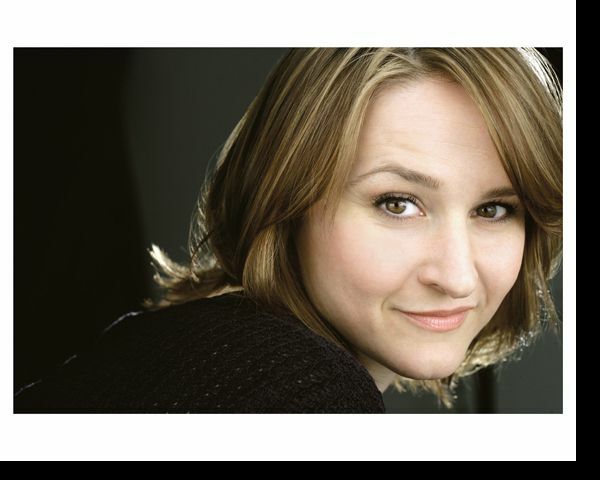 She is also an actor who has performed off Broadway, on As The World Turns and Guiding Light, and in her own solo play BabyLove which won Best of Fringe at the 2006 San Francisco Fringe Festival and the Audience Award at the Frigid Festival. 1. My father, John M. Clifford, Sr., was known as Jack. He read my hometown rag, The Buffalo News, as well as The Wall Street Journal, Barron’s, and various financial magazines. Towards the end of his life he traded the Wall Street Journal for the brightly colored pages of USA today. Don’t get the idea because he liked to read about money that we had any. He was a self-employed electrician who liked to play the markets. I read the New York Times. I’m addicted to it. I used to read it for four hours a day (easy to do when you are unemployed). Now I have a child and am lucky to skim the Sunday paper. I was born when he was forty-nine years old, the youngest of his eight children. We didn’t share many interests except for brief intervals—one summer when I was on our local softball team The Mel Ott Sizzlers and a winter when I took tennis lessons. I was interested in the arts: painting, ballet, theatre; and my father was interested in sports: ice hockey, baseball, football. He didn’t seem to need stories or art, or novels, or dance; when I was growing up he didn’t even enjoy watching TV shows or movies. He wanted everything to have a practical purpose. There’s a family story that at a party he met Mr. Knox, the namesake patron of the Albright-Knox Art Gallery in Buffalo, a museum known for its large collection of Abstract Expressionism. “I just don’t get why anyone would want to look at this stuff, ” he said to him. My mother, who had a love of the arts—and I’d wager was pretty excited to be at a party with the Knoxes—is said to have not spoken to my father for a week. The last few years of his life, he talked more when I saw him, but at the same time he turned off. He stopped answering the phone; he rarely left his room; we had to practically force him to family dinners. He retreated into that specificity of old age that included leaving any dishes he used regularly in the drying rack. It was as if he didn’t want to open any drawers or cabinets that didn’t need to be opened. He woke at 7 and took an hour-long shower to sooth his rheumatoid arthritis, then had juice, instant coffee, and generic raisin bran for breakfast. When I visited, I always made the mistake of putting his dishes away in the cupboards and turning up the heat and throwing away his collection of tin foil. He didn’t like me changing his things. When he went to work (even into his seventies he still he worked as an electrician) I rifled through his top drawer—trying on his discarded eyeglasses, smelling the worn leather of old wallets, tossing silver dollars. In the evenings, we watched Market Watch, Wheel of Fortune, and whatever game was on. Sometimes I’d try to convince him to watch a film with me, but then he’d just go watch a game by himself in his bedroom, so I’d watch the game, not knowing what was happening, just to be in the room with him. I think he gradually came to realize that having his rituals disturbed was the price he had to pay for the supposed delight of having one of his children in the house again. I didn’t call often. When I did, it was usually after a playoff game in football or baseball, or during Wimbledon or the US Open, so we would have something to talk about. I liked tennis and followed it for pleasure but mainly for him. I repeatedly offered to bring him to New York and take him to the US Open, but he always said something like, “Why would I want to do that? I can see it better from my TV.” I haven’t followed the tennis since he died. decorated in permanent marker with the logo for The Splatcats. Red lipstick and a platinum blond bob completed the look, and my father said, “You look like a whore.” I ran into the house slamming the screen door on purpose to annoy him more. I remember raging, “How dare he?” But now, I can see his point. In high school, we tried to ignore each other, but in college I began to despise him. My mother had Parkinson’s disease and her health was getting worse. I got accepted early decision to the NYU acting program in New York City, but my father wanted me to go to the State University at Buffalo, where I had received a full scholarship in theatre even though I hadn’t applied. (Yes, I’m bragging. The head of the department had seen me in a local play. I was good.) My father wanted me to stay home and take care of my mother. I don’t know what made him think I’d be any good at it since I’d spent a third of my high school years at my friend Rachel’s house; her mother had given me a set of keys and the alarm code and let me take over the guest room. When I was home I was fighting with my mother, angry at her for being sick, fed up with her bossing me around and telling me how to dust and vacuum and make pineapple upside down cake and meatloaf exactly the way she wanted it done, as she could no longer do it herself. The only cooking I had freedom with was spaghetti sauce and stir-fries. Everything else had to be done according to her orders. I went to New York to get away from her and she continued to deteriorate. From NYU, I would call home and no one would answer. My mother couldn’t get to the phone in time. This meant she was by herself in the house. Once she fell in the basement, into a laundry basket and couldn’t get up until he came home from work. She was stuck in a laundry basket all day, uncomfortable, exhausted, surely soiling herself. I blamed my father for leaving her alone. I hated him not only for his lack of care, but my own. I wasn’t going to stay home to take care of her. I couldn’t really blame him for not wanting to either. After my mother was moved into a nursing home my parents had dessert together every night. 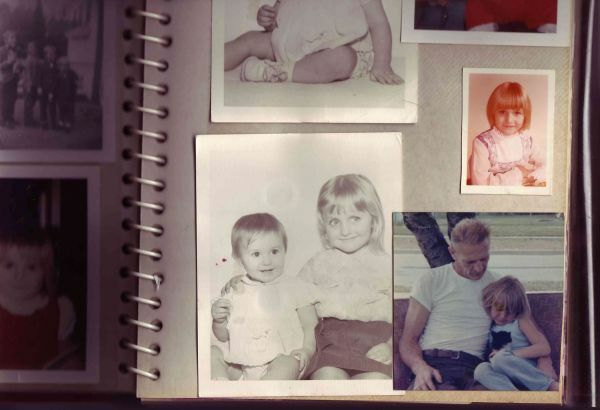 My father usually arrived at nine PM and flirted a little with the nurses, then helped himself to two of the little round paper containers of ice cream that I remember from my school days, eaten with a flat wooden spoon that came wrapped in paper. In my head, he went quickly from sinner to saint, but I’m sure he was just someone in between, like most of us. We became a bit closer. I wrote him a letter, asking him all the questions a daughter wants to know about her father but never expects answered. Do you still love mom? Have you ever cheated on her? Did you really want to have eight children? Of course he didn’t answer, but I thought he was a little gentler with me that Christmas. 4. When I left home, he clipped articles from the newspaper for me: about a band I liked, about my ex-Buffalo-actor-boyfriend, about my old gym teacher. He would leave them for me on the stairs to my old room. It takes effort to love someone through clippings. You have to find the scissors; turn the page over to make sure you’ve read the other side; cut out the bit that you think will interest your intended; set that aside, and then find an envelope and a stamp, address the envelope, write a quick note on the clipping or stick a post-it to it, and finally, make sure to put it in the mail. I always feel special when someone sends me a clipping or photocopy in the mail. I know the effort that went into it. The sender was thinking of me. I like being thought of. I feel loved. Of course, he didn’t mail them, but I felt like he did. to think about it, but then why did he watch the History Channel all the time? I like to think that he did need storytelling and art in his life. I remember as a child that we had actual photographs of concentration camps that he had taken, photos of the bodies in mass graves. I took them to school to show my seventh grade history class. I can’t understand what it meant to witness that, and then go back to college. I can’t believe that I never asked. There is an article from The Buffalo News about his rejection from Dodger training camp. This is the baseball story. “Clifford was deemed too old at 25 to start a pro career.” Maybe if the war hadn’t interrupted his college career at MIT, he could have been a professional athlete. I want to believe that he could have lived his dreams. It’s my tendency to romanticize him, now that’s he’s gone. He coulda been a contenda! He married and fathered his large family, all the while staying in the news. 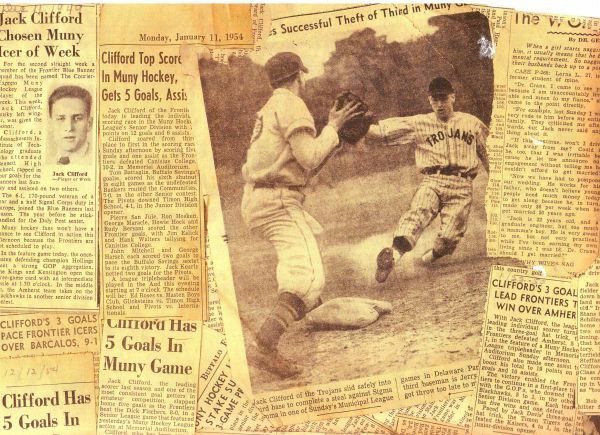 He played hockey in the local MUNY hockey league: he was a defenseman on the Rochester Olympics, the Frontier Blue Banners, the Rothschild Champs, as well his own team, Jack Clifford Electric, Inc. He was a defenseman who was also a top scorer, winning the league leading scorer award for the ‘53/’54 season. This all puffs me up. After he turned 50, he played on The Amherst Antiques, and was inducted into the Amherst Hall of Fame in 1980. He played hockey the day before he had the heart attack that killed him. 6. When someone dies, there is inevitably a sense of something unfinished, undone, unsaid. He thrived on hard work, and I suspected that he thought of the theatre as a kind of wussy aspiration and that he respected me more for my off and on work as a waitress. That was work he could understand. I failed at getting him to understand that theatre was blue-collar work. When I became a working actor in the theater, the only time he asked me about my work was on a visit home; he was reading the paper waiting for me to cook dinner. He lowered the paper and said, “Don’t you get bored doing the same thing night after night?” I started to reply, “No, it’s actually really different every …” but he had raised the paper in front of his face again. I resented the newspaper for coming between us. less so of mentions in smaller arts weeklies. When I moved recently, I came across recent clippings from The Burlington Free Press. I realized I never sent them to him because I wanted to star on Broadway and instead was playing Pinter in the provinces. He wouldn’t have cared. There was a front arts page feature article with large flattering photos of me in demure costumes. But I couldn’t see that, only that I was doing a small production in a small city, far short of what I had expected of myself. I wanted him to be proud of me. Of course I underestimated him. has been diagnosed!” No one in my family throws anything out. My father grew up in the Depression. He had drawers full of twist ties and rubber bands and aluminum foil. You couldn’t walk or park a car in our garage, for all of the not-worth-throwing-out-but-not-quite-in-working-order objects: rakes, snow blowers, bicycles, jugs of windshield wiper fluid with an inch in the bottom, old tins of paint, ripped and smelly hockey bags, bats, balls and sticks. He taped the article I sent to the garage door and I was so proud, it was like having my report card with a gold star on the fridge. I sent him news of the latest medicines and alternative therapies for his rheumatoid arthritis: Omega–3 oils, Chinese medicine balls, Glucosamine. Anything to get rid of “His friend,” as he called it, “Arthur Itis”. The joints of his thumbs would swell up like golf balls and his neck would stiffen. He could barely skate some days. As it worsened, I dreamed that a drug called Humira would work for him like it did the people in the commercials: inject it once a week and swing a golf club with ease. He could have still gotten enjoyment out of his life if he had had some freedom of movement. ziplock bag along with instructions to defrost in the fridge first and then cook for 20 minutes in a 350 degree oven. I’m sure he never defrosted them and just threw them in the oven. Roasted chicken with maple and lime glazed carrots. (”Holy-Moly.”) Crisp roasted potatoes with rosemary and sea salt. Scrambled eggs with heavy cream and fresh chives, with thick cut bacon from my butcher in Brooklyn. I had finally found something I could do that pleased him. One of the last clippings he left for me was from the Wall Street Journal. It was a column about how people cook for each other to express love. He loved me by clipping an article about how I loved him by cooking. Thanks for sharing a very personal perspective on our father. I am blessed to be a dad at age 50 to a new baby girl and will face some of the challenges you describe in father daughter relationships in the years to come. I am grateful for the heart opening moments I share with my daughter daily. I am reminded of the limits of my ability to be patient and love what is …. even when it is throw up , unhappy cryuing , or a stinky diaper. Your clippings will survive as archived fragments of shareed life on the archived web..
I’m very sorry to hear about the death of your father–he and my father Ted were very good friends at MIT: playing hockey, other sports and working in the dining halls together). 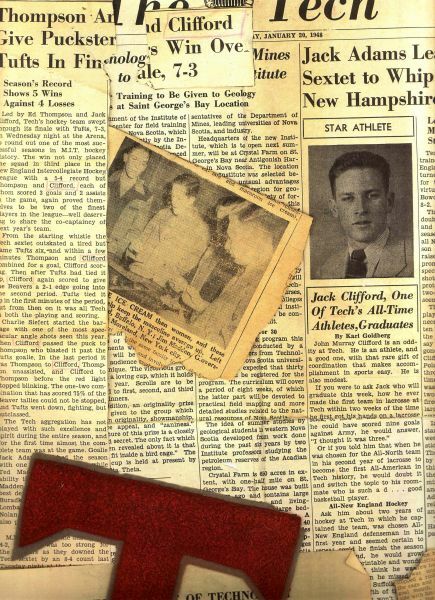 My father always spoke glowingly of him, he really looked up to Jack and his good sportsmanship, and even ended up winning the MIT senior best male athlete award which was named the Clifford Award at the time. I remember meeting him when i was just a little girl–he showed us a picture of you, and I could tell he was very proud. My father is aging himself nowadays, he will be sorry to hear of the passing of his old friend. I’m so happy to have found this wonderful piece you wrote about you and your dad. Like you, my dad also recently passed away, and like your dad’s way to show you his love through clippings, my dad was also particularly not expressive verbally, yet also had indirect ways which I found clearer as he aged. I vividly recall meeting your parents, and being so happy of how well received I was by them. Your mom used to send me little gifts periodically, which I knew as a token of their love. Further, with your article above, I learned something I never knew: your dad’s witnessing some of the WWII horrific holocaust results while on duty. I wish I had known this earlier! In any case, thank you for sharing this article, which posthumously adds even more to my appreciation for them. After ?ll, when will you one day think “I’m done growing. There are extra techniques the hemorrhoids may manifest than you can visualize. One of the Eight Taoist immortals Han Xiangzi was fabled to be able to lie asleep snoring in one room and project his spiritual double into a banquet room where he greeted some officials. Simply want to say your article is as surprising. The clarity in your post is simply great and i could assume you’re an expert on this subject. Fine with your permission allow me to grab your RSS feed to keep up to date with forthcoming post. Thanks a million and please continue the rewarding work. I simply want to say I’m very new to blogs and definitely loved your blog. Most likely I’m planning to bookmark your site . You absolutely come with awesome posts. Thanks a bunch for revealing your web-site. You actually make it seem really easy together with your presentation however I in finding this matter to be really something which I feel I might never understand. It seems too complex and very vast for me. I am taking a look forward to your next publish, I will attempt to get the hold of it! Thank you, I have recently been searching for info approximately this topic for ages and yours is the greatest I’ve came upon so far. However, what in regards to the conclusion? Are you certain about the source? Thanks for some other informative website. Where else may just I get that kind of information written in such an ideal approach? I’ve a venture that I am just now running on, and I have been at the look out for such info. My spouse and i ended up being quite excited Emmanuel could deal with his research using the ideas he came across through your web site. It is now and again perplexing to just possibly be handing out ideas a number of people could have been making money from. And now we take into account we have you to give thanks to for that. The type of explanations you made, the easy website menu, the friendships your site assist to create - it’s got mostly unbelievable, and it’s leading our son and us recognize that that situation is brilliant, which is really vital. Thanks for all! I would like to thnkx for the efforts you’ve put in writing this web site. I’m hoping the same high-grade site post from you in the upcoming also. 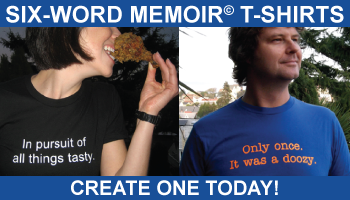 In fact your creative writing abilities has inspired me to get my own site now. Really the blogging is spreading its wings fast. Your write up is a good example of it. obviously like your web site but you have to check the spelling on several of your posts. A number of them are rife with spelling problems and I to find it very bothersome to inform the reality on the other hand I¡¦ll definitely come again again. I was just seeking this information for a while. After six hours of continuous Googleing, at last I got it in your website. I wonder what’s the lack of Google strategy that don’t rank this kind of informative sites in top of the list. Normally the top sites are full of garbage. whoah this weblog is great ogpfdoss i really like reading your posts. Keep up the great paintings! You understand, many persons are hunting round for this information, you could aid them greatly. Thanks for another magnificent post. Where else may just anybody get that kind of info in such an ideal way of writing? I’ve a presentation next week, and I’m at the search for such information. One more thing. I do believe that there are lots of travel insurance internet sites of reputable companies that allow you to enter your holiday details and find you the prices. You can also purchase the international travel cover policy on-line by using your credit card. Everything you need to do should be to enter all travel information and you can understand the plans side-by-side. Only find the package that suits your financial budget and needs after which it use your bank credit card to buy it. Travel insurance online is a good way to do investigation for a respected company with regard to international travel insurance. Thanks for sharing your ideas. Nice read, I just passed this onto a colleague who was doing some research on that. And he actually bought me lunch as I found it for him smile Thus let me rephrase that: Thank you for lunch! “It is impossible to underrate human intelligence–beginning with one’s own.” by Henry Adams. I’m impressed, I have to say. Really rarely do I encounter a weblog that’s each educative and entertaining, and let me inform you, you’ve gotten hit the nail on the head. Your idea is excellent; the problem is one thing that not enough individuals are speaking intelligently about. I am very joyful that I stumbled across this in my seek for one thing regarding this. A lot of of the things you claim is supprisingly appropriate and it makes me ponder why I hadn’t looked at this with this light previously. Your piece truly did switch the light on for me as far as this subject matter goes. Nevertheless there is actually just one factor I am not necessarily too comfy with and while I try to reconcile that with the actual central theme of the position, permit me observe what the rest of your visitors have to say.Very well done. of course like your web site but you need to check the spelling on several of your posts. A number of them are rife with spelling issues and I find it very bothersome to inform the reality then again I will surely come back again. It’s remarkable in favor of me to have a website, which is helpful in support of my experience. excellent issues altogether, you simply gained a brand new reader. What could you suggest about your put up that you simply made a few days in the past? Any certain?